her parents at age 12. For Aide Sanchez of Fredericksburg, Attorney General Mark Herring’s announcement that DREAMers would be eligible for in-state college tuition was a godsend. “It means in the spring semester , I will be able to go back to school and finish my degree,” Sanchez says. 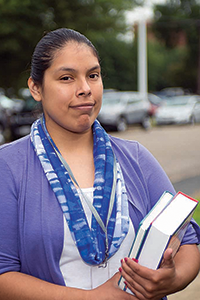 After earning an associate degree in 2012 at Germanna Community College with an emphasis in biology and the sciences, she enrolled at George Mason University in Northern Virginia with the hope of pursuing a degree in neuroscience. “I went there for two classes. It was $9,000. It was just too expensive,” Sanchez says. She says George Mason officials have told her that by being eligible for in-state tuition, she will now be paying only $3,000 to $4,000 per semester for a full load of classes. She, however, will not qualify for federal financial aid. As a rule, no DREAMers do. But Sanchez holds out the hope that she may be able to find private scholarship help. Sanchez, 26, came to the U.S. with her family — her father is a welder and her mother a homemaker — when she was 12 and moved to Virginia when she was 13. She has lived in the commonwealth ever since. When she graduated from high school, she accepted but didn’t understand why she wouldn’t qualify for in-state tuition. Her parents, she says, were paying taxes like everyone else. “When I received deferred action, I could get a driver’s license, a Social Security number and a work permit. But I still didn’t qualify for in-state tuition — that was the hardest part for me,” she says. Sanchez says she worked 50 hours a week to help pay her way through community college and became a manager of a Five Guys restaurant. She now is working as a prevention specialist for the Fredericksburg Area HIV/AIDS Support Services and will continue to work and commute to George Mason.